10.25" x 10.25" x 3.125"
Eco-Optiloc™ has the highest mechanical installation rates of any interlocking permeable paver. The patented L-shaped design makes the paver clusters easy to install quickly and accurately. Installation rates up to 12,000 sq.ft. per machine per day have been documented. This makes Eco-Optiloc™ a very competitive permeable pavement that can be installed even in adverse weather conditions. 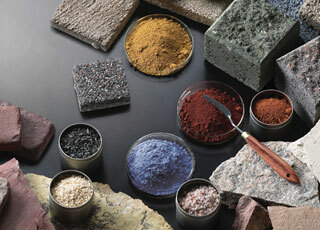 Most standard colors are available by special order only and subject to minimum quantities. Contact your representative for details. This product is optimized for mechanical installation. Sold in full bundles only and is shipped on a refundable skid. All measurements are nominal. Important: Textured surfaces require a buffer between the plate compactor and the paver surface to prevent scuffing. Eco-Optiloc is the paver-of-choice when it comes to vehicular load performance and as an environmental solution for permeable paved surfaces. The patented "L" shaped design allows you to achieve a superior lock- up that can withstand even the heaviest of loads. Surface textures can be customized for commercial projects. Base Requirement & Bedding Course – open graded base specification. Handling and Installation– A protective pad is recommended when doing the final paver compaction. This product can beinstalled mechanically or by hand.